If you are like many homeowners, you want to do everything you can to make your property more environmentally friendly. From reducing energy costs and shrinking your carbon footprint, there are so many reasons why making your home more eco-friendly is a great idea. One area that shows a lot of potential for decreasing the environmental impact of your property is your HVAC system. 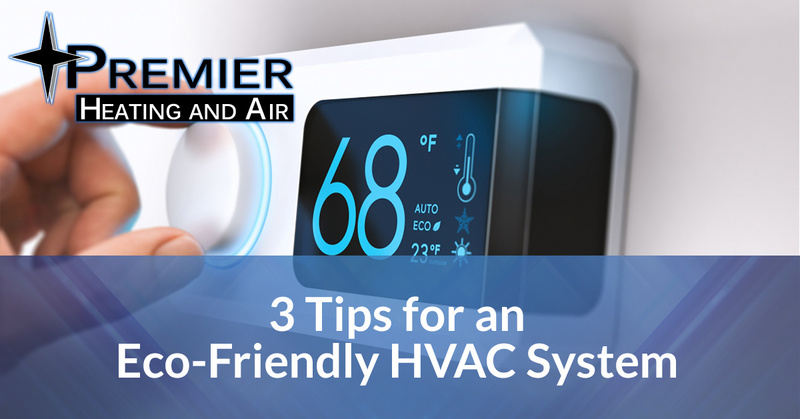 In this blog, we will go over some tips for making your HVAC more eco-friendly. A simple way to save on energy costs is to increase your home’s temperature by ten degrees in the summer, and decrease it by ten degrees in the winter. However, it’s not always easy to remember to adjust your thermostat, making it more difficult to benefit from this information. With a programmable thermostat, you don’t have to worry about it anymore; simply program your thermostat to adjust the temperature, letting you consistently save on your energy bill. Contact us here at Premier Heating & Air and we can install it for you! If your HVAC ducts aren’t sealed or have incurred damage, you could be losing up to 25 percent of your energy. Check your ducts to make sure that there is no air leaking through and that it is evenly distributed through the different rooms in your home. Because your unit is outdoors, it can accumulate dirt and debris, which can interfere with your HVAC system’s performance. Check the coils of your system every month to clear out any leaves or other debris stuck on the unit. When you want your HVAC system to become more eco-friendly, contact us for our HVAC services in Denver. As your favorite heating and cooling company, we know what it takes to reduce your environmental impact through your HVAC system. Contact us today!